Until we find our treasure we cannot share it and it is in sharing our treasure, the truth of who we really are, that we serve others. FindYourMojo is a tool that combines the oldest of principles with the lastest of technology to guide you in your personal treasure hunt. 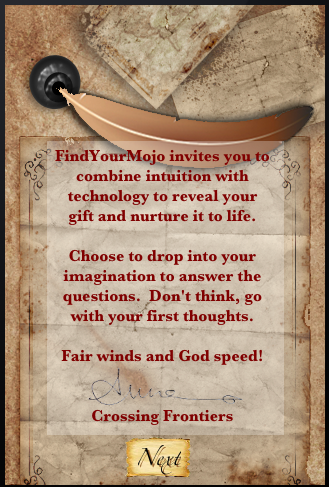 FindYourMojo is the first of the SatNav4TheSoul toolbox apps that combines intuition & technology to reveal your unique talent. FindYourMojo was inspired by Nick Heap’s Core Process coaching work. Nick has a background in Corporate Management in ICI guiding people to be the best of who they are. The App concept was created by Anne K. Scott who after 30yrs delivery large corporate tech systems decided to go back to the basic principles and the technology of imagination. The app was implemented by Richard Hoffman whose passion is games development. FindYourMojo is an example of the synergy that can be created when you find your special talent.